The deep, rich sparkle of a sapphire has made this gem a true classic, and this timeless beauty gets a striking modern treatment in this tension set sapphire engagement ring in 14K white gold. 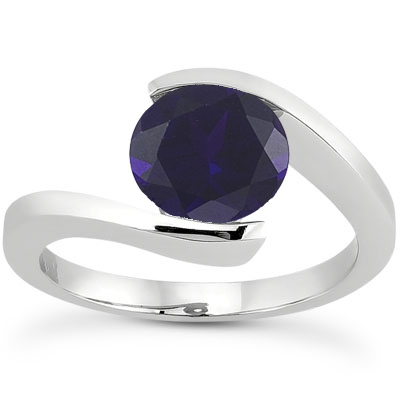 A 6.5mm round sapphire catches the eye from the center of this ring with its sophisticated, dark blue hue; it's complemented by a unique tension setting that seems to suspend it in thin air. Two arms of 14K white gold squeeze this stone as they emerge from the shining band. 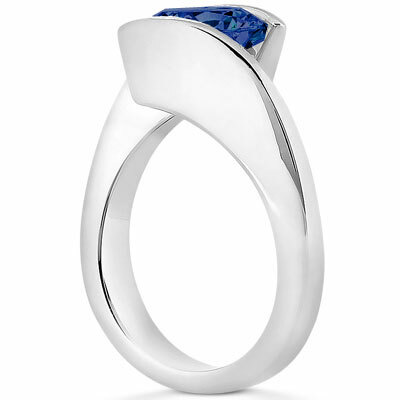 Unlike Elvis this 6.5mm tension set sapphire ring will go with everything in your wardrobe. We guarantee our Tension Set Sapphire Engagement Ring to be high quality, authentic jewelry, as described above.